Tea at the Sofitel Philadelphia. Is there a better way to spend a bleak winter midafternoon than sipping tea and eating pastries in a classy restaurant? If so, I can't think of one. But which classy restaurant? With the end of tea service at the Ritz-Carleton (with the dawn of Richard Sandoval's Latin American restaurant Aquimero) and the Four Seasons (with its 2015 closing), the high-end tea scene in Philly isn't what it used to be. It's better — less stuffy than in the white-glove, floral china days but just as rewarding, I discovered as I downed tea, scones, and food that doubles as artwork at Center City's four big restaurant hotels. An intermezzo of floral tea water ices, part of the special Flower Show tea menu at the Rittenhouse’s Mary Cassatt Tea Room. The Rittenhouse is now the only hotel in town still offering daily tea in its own dedicated space. Named the Mary Cassatt Tea Room after a few of the artist's sketches that hang on the wall and the hotel's location on the site of her brother's townhouse, it faces a garden terrace that adds six tables in nice weather. Tea servers AJ Memmo and Kidist Anosa selected the 16 teas they serve and discuss them with authority. The food is as good and as fussy (in a good way) as you'd expect at these prices (almost twice that of the competition, despite modest portions). Days after, I was still thinking about the orange-accented edamame hummus on a radish, avocado, prosciutto, and onion jam sandwich. This is also the only local tea with live music (by a harpist, Fridays through Sundays). At one point, I looked up to see an elegantly dressed young woman attending a tea shower swaddling her baby: a Mary Cassatt painting come to life. $55 (including sparkling wine) or $80 (with Champagne moussé) per person, 2-5 p.m. daily, 210 W. Rittenhouse Square, 215-546-9000, rittenhousehotel.com. Tea at the Hyatt at the Bellevue. The Bellevue's century-plus-old daily tea service took a hit with the modernization of the hotel's dining spaces in 2007. Tea in the former Barrymore Room, now the XIX Cafe, is served on weekends only and is pre-brewed — meaning its teas are only descriptions on the menu instead of in containers of leaves to see and sniff (as at the Rittenhouse and Sofitel). But with a 30-foot domed ceiling and floor-to-ceiling windows overlooking the city, this is still a beautiful place to down a pot and a pastry. XIX's solid three-tier presentation of the usual tea suspects will get an extra dose of flavor from edible flowers after its tea menu's March 1/Flower Show reboot. Also new to that spring menu: a white tea in a glass pitcher made from a "bulb" of dried leaves and flowers that "blooms" as it steeps. The Philadelphia branch of this French luxury hotel chain began offering high-season (Dec. 1 to March 31) daily tea service in its urban-chic Liberte Lounge four years ago. 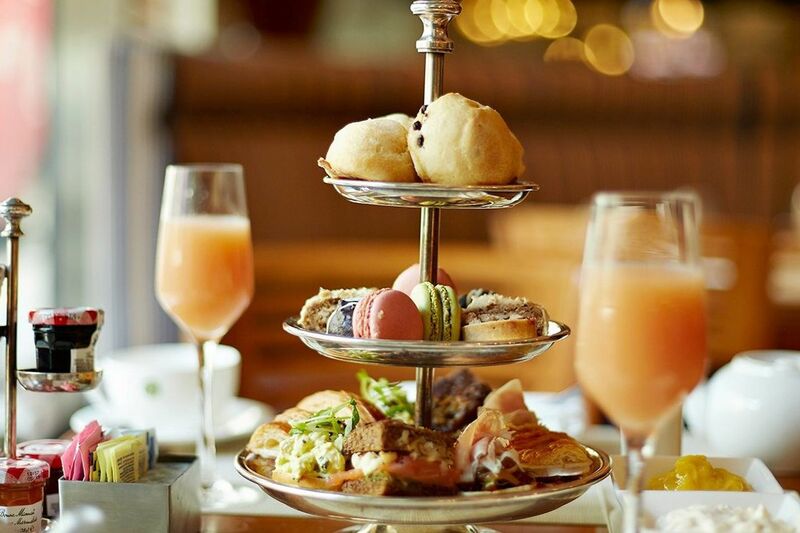 The nine teas are from Paris' Palais des Thes, and chef Edward Hancock puts his chicken salad on a croissant. Otherwise, the menu is similar to the competition (if slightly less refined). The table by the gas fireplace is the primo seat in cold weather, although my tea's relax factor was marred by the anxious conversation of some businessmen meeting nearby. You could theoretically run into that at any tea in town, though it would seem less likely at XIX or the Rittenhouse. $29 or $35 (with Champagne or a mimosa) per person, 2-4 p.m. daily through March 31, at 120 S. 17th St., 215-569-8300, sofitel-philadelphia.com. Afternoon tea is an English tradition, and Dandelion is an English pub that debuted with tea and scones on its midday menu. Four years ago, in response to diner demand, it added tea sandwiches and pastries. So what if teas in England are traditionally offered at hotels or tea houses? Dandelion's tea menu evidences the same kind of freewheeling attitude. Items might be English-inspired but this Stephen Starr stalwart is not a slave to authenticity at the expense of American enjoyment. The chocolate pudding cake on the sweets tray is more like a chocolate molten cake or super-rich brownie, and all the better for it. Dandelion also has the best macarons of any city tea (Dandelion pastry chef Abigail Dahan does double-duty at the nearby Starr French bistro Parc). The smoked bacon and orange marmalade on pumpernickel was a savory revelation. The tea selection is limited to a few Twinings and Teapigs (and don't expect your server to provide much guidance). The Dandelion's houselike space, with multiple rooms, is appropriately cozy. But the indie rock soundtrack (likely a consequence of the many different ways diners are using this place midday) can be jarring. The food really is the thing here. $50 for two (á la carte options also available), 3-5 p.m. daily, 124 S. 18th St., 215-558-2500, thedandelionpub.com. If you're looking to meet expectations created by teas currently served in Center City Philly, the following would be a good starting place for a DYI afternoon tea. Creative variations on these themes are what will make your tea stand out. When it comes to size, think small: no more than three or four-bite-size for savory items and one or two for desserts.